Simplified, consistent, and reliable methods for creating portrait sculpture in half the time. 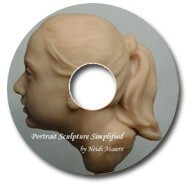 Portrait Sculpture Simplified is a complete instructional course encompassing all of the tips, techniques, and tricks I've learned over the past 20 years through both formal academic instruction and practical trial and error. You will save countless hours of frustration and "learning curve" because I have already been through the process and will guide you toward the most simplified, effective techniques. In numerous areas I have included valuable information that has never been taught in school or found in print. 194 (81/2" x 11") pp., 352 color photographs on one CD.